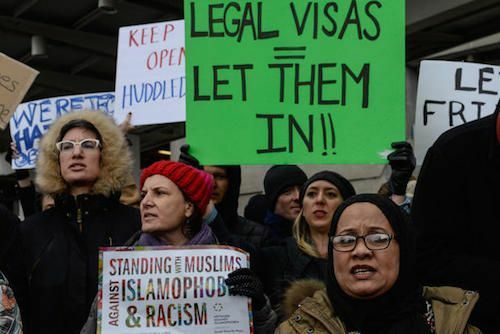 Two Yemeni brothers, who were coerced into giving up their green cards immediately after Donald Trump's immigration ban, are unlikely to have them returned. The documents - which granted them the right to permanent legal residence - were "voluntarily rescinded" in the US government's view, the pair's lawyer, Simon Sandoval-Moshenberg, told Convershaken. President Trump recently signed an executive order that bars immigration to the US from seven Muslim-majority countries, suspends the nation's refugee programme for 120 days, and blocks the entry of Syrian refugees indefinitely. Immigration officials were given little to no guidance on how to implement the policy, meaning they initially applied it to green-card holders from the targeted countries. The government later clarified that they were exempt. The announcement came too late for 21-year-old Tareq Aqel Mohammed Aziz and his brother Ammar, 19. The brothers took off from Djibouti two hours before Trump signed the executive order. They landed at Dulles International Airport in Virginia on Saturday, planning to catch a connecting flight to Flint, Michigan, to join their father, a US citizen. Despite being approved for legal permanent residency, they were escorted off the plane in handcuffs, according to The New York Times. Officials led the brothers into a room and told them their visas were cancelled, and that they needed to sign a form or they would be barred from the US for the next five years, according to their lawyer. They signed the form, which indicated they were voluntarily giving up their permanent residency rights. They were put on a plane to Ethiopia within two hours, where their Yemeni passports were confiscated, leaving them stranded. A ruling from a federal judge - stating immigrants with legal permanent resident status could have access to lawyers during detention and couldn't be deported until seven days after arrival - came too late for the Aziz brothers. They remain in Addis Ababa, Ethiopia, according to their lawyer.